Yes, I was raised in the South. 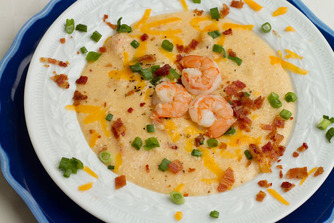 Yes, grits were served at almost every major family breakfast. Yes, they were a favorite food staple of many of my family members. But, I have to be honest with you, I was NOT a fan of grits. Bland, sand-textured mush was not my idea of delicious…no matter how much butter you puddled on top. Occasionally I would find a bowl of the more gourmet “cheese grits” bearable. But given the chance, I would pass on the gruel and opt for another side dish. That is until I had them in a French restaurant. A few years ago, my husband and I were traveling and decided to enjoy a special brunch at a restaurant I had heard rave reviews on. As usual, I was very excited at the prospect of a delicious meal prepared by someone else. As the waiter took my order for some main dish that at the time seemed incredibly impressive, I was horribly disappointed to find out that the required side dish was…grits. As I pandered over the order and considered ordering a totally different entree (they were not at all flexible about the side options), the waiter enthusiastically gushed about how amazing the grits were. He ended up guaranteeing me that I would love them…or he would bring me another dish. How could I balk at such confidence? I had nothing to lose. When my order later arrived, I cannot even remember what it was. All else paled in comparison to the grits! They were absolutely AMAZING. Before leaving the restaurant, I had already begged my waiter for the recipe and tried to sneak into the kitchen. Though they did not provide the recipe, the waiter was gracious enough to share a few key ingredients. I ended up creating a similar recipe at home and with several experiments developed it further. Now this recipe has served me well, even when I’ve made breakfast for Northern friends who were vehemently against the thought of “grits”. By cooking everything overnight in your slow-cooker, you will further enhance the texture of this dish, from “grainy” and “gritty” to more creamy and fluffy. They are simply delicious!